Kalmbach Publishing has released a cover image for my next book. You can pre-order it here. • A rare combination of historical text and photos. • Track plans that illustrate how to model a military railroad from various time periods. Model Railroads Go to War is expected to ship 12/31/2014. I will have signed copies for sale on my web site in January. On Saturday I gave two talks at the B&O Railroad Historical Society Eastern Mini-con at Martinsburg, WV. I was first to speak, which meant a really early wake up in Alexandria to get to Martinsburg by 0830. But it was a beautiful day for a drive in the country. Loudon County, Va has to be one of the most beautiful places in the US. Martinsburg is a nice town too. I had fun doing my talks and I think the audience enjoyed them. Afterwards John Teichmoeler did a talk on ￼ B&O’s Marine Operations on the Ohio River, starting in 1855. I found this talk very interesting as he explained how the operation worked in great detail. He also mentioned how during the move of XI and XII Corps in 1863, the river was so low that the engineers built a pontoon bridge to get the Army units across the river. You can read more about the history at the article by Frank Dewey at this link. John has developed a set of plans for one of the paddlewheel river tow boats that the B&O used. We may cooperate in the future to produce a kit for it. He also implored us to pick up a up of his book on Pennsy Hoppers as the funds go directly to Kathy's, his wife, cruise fund. from MRP 1998. Gosh was that 16 years ago already? Next John King described the thought process leading to the design of his B&O Winchester layout. His presentation showed a nice selection of color images he shot during his not-so-misspent youth chasing trains in Maryland and West Virginia while hanging out at operator cabins and towers. He really likes winter rail fanning as he had a bunch of nice winter images. John's layout was featured in MRP 2005. 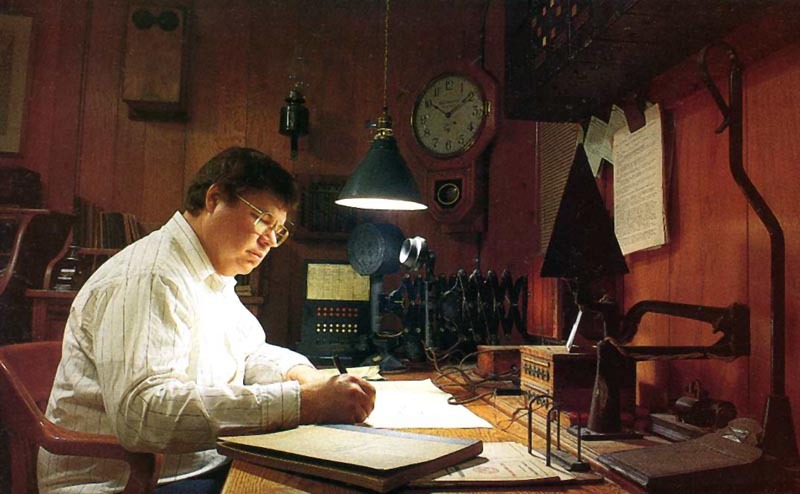 One aspect of John's layout that is really neat is his dispatcher's office. It includes full set of authentic equipment. At some point I'd like my dispatcher's area to be similar to this. After the meet I stopped by the Martinsburg Roundhouse as it was open for touring. These structures were built right after the Civil War as the original buildings were destroyed during the war. There are two roundhouses there, but one burned a few years ago. There is an effort to restore the remaining roundhouse. See here for more info. During one of the breaks between talks, David Bridgham, showed me the plans for a layout he is building. I was thrilled to see that he is using the larger HO plan for Sparrows Point that I included in my book on Steel Mill Modeling. He has modified the plan slightly to fit the space he has. This is an ambitious plan, and he expanded some areas, such as the skull breaker and coke works, to have even more of the mill actively modeled. I am excited to see how it turns out. A friend recently alerted me that Amazon is now taking advanced orders for my new book, "The Model Railroad Goes to War." It is due 1 January 2015. I do not have any further information, but will post any news as soon as it is available. I will offer signed copies from my website when the publication date approaches. Below is an updated schedule of events where I will be doing talks in the next few months. If you are nearby please consider attending. 9:00AM Aug 2, B&O Historical Society Mini Con, St John's Lutheran Church, 101 W. Martin Street, Martinsburg, WV Membership in the B&OHS may be required. I will be doing two talks, One is the Intro to RRs of the Civil War. The second is on the B&O Armored Car project. 2:15 Aug 9, Capitol Limited, N Scale East Convention, Chantilly Expo Center. This is part of the N scale convention. Registration for the convention will be required. Time TDB, Sep 12-13, The Model Railroad Goes to War, Middle Atlantic Railroad Prototype Meet (MARPM), Wingate by Wyndham Hotel, Fredericksburg, VA. Registration for the meet is required. This will be a new talk I am developing to coordinate with my upcoming book about the role of railroads in warfare. The talk will include dozens of additional photos obtained from the National Archives and other sources not used in the book. The convention staff asks that you register as soon as possible in order to reserve a spot. Time TDB Sept 20, James River Subdivision of the NMRA. The Model Railroad Goes to War. See http://jrdnmra.blogspot.com/ for more info as it comes available. Time and October date TBD, Porter Branch of the Stafford County Library. This library is just a few miles from the location depicted in my model railroad. We haven't nailed down the date yet. I'll post it when it is available. This event will probably be free to attend.